One week to go until the start of the Portsmouth Dreadnought’s first Division One season we thought you might like to get to know some members of the team a little bit better. Starting with Defensive standout Cameron Dalley whose effort and dedication creates positive leadership through his actions. Here’s what his Defensive Back coach James Harris had to say about Cam. Hi Cam, thank you for taking the time to talk with us. How did you get into American Football and what do you enjoy about it? I was constantly pestered by my course mates to come to a practice session. My university team was receiving coaching from the Edinburgh Wolves at the time so my first session (with a stinking hangover) was pretty much a baptism by fire. I had next to no prior knowledge of the sport but I knew the sport was much more aggressive than rugby. I felt it was the only way to de-stress during my masters year and just take out any anger I had onto the field. The first time my captain saw me tackle a receiver, he jumped up and down and told me “I need you as my Free Safety right now!” When I graduated I spent two seasons playing with the Aberdeen Roughnecks (my home city) and it really took off from there. I enjoy the sport because you can unleash your aggression and it requires the utmost passion and commitment to play well. It is the most difficult sport I’ve ever played and requires years of practice to master technique. It is a very complex game (sometimes compared to chess in strategy terms) and you need to have somewhat of an academic side to understand it in its entirely. You will need to study how other teams play and adjust your own strategy to counter theirs. Aberdeen Roughnecks vs Newcastle Vikings (away game 2016). Got my first interception as a rookie and we beat Newcastle (undefeated in the division) against all predictions in the last 8 seconds with a PAT. The bus journey back was a riot! A very happy memory. Newcastle went on a mad rampage afterwards in the league and burgered (put up more than 50 points on) all the other teams. How are you feeling about the upcoming season with the Dreadnoughts? It’s our first time in Division 1. We were promoted because we had a competitive edge and played harder than most. We will be going against like minded, ambitious teams with some serious athletes and veterans. Every game will be tough, but no one plays football because it’s easy. To win, we’ve got to be ferocious. Our first game sets the tone for the season and Solent is a strong opponent. The Dreadnoughts can come out on top this season if every team member offers 100% of their energy (100% of the time), maintains high attendance at practice and stays disciplined. We can’t afford to manage big egos; it’s about respecting the sport. I think we can all respect that, nothing is given, success is earnt through hard work. You play DB, why did you chose that position? A hybrid of agility and tackling. I love playing safety because you can analyse each snap as it unfolds and make a huge impact by disrupting a pass or coming down hard on the run. I’ve always found playing cornerback to be harder. Especially 1 on 1 with no help over the top (just you and him). The pressure can be immense when you’re defending a 3rd/4th and long or you’re beaten back to your endzone, you’re exhausted and if they score they win – but you’ve just got to focus and have the resilience to kill their drive! The reward for stopping plays that big can mean the difference between winning and losing a game. What advice would you give someone who is interested in giving American Football a go? “Grafting” – Scottish slang for working real hard. You’ve got to graft from day 1 on the pitch and keep going. You will be infront of the coaches all the time. They are always watching and will reward hard work and commitment with a starting spot if you’re good. This can also lead to Captaincy. I started for my first game as a rookie because I made sure I earned a reputation for tackling and commitment with high attendance. You will love the sport and the comradery that comes with it! Try to seek out advice from the coaches and the veterans. It’s much harder to curb bad habits than correct technique early on…I still can’t catch and I’ve played 4 seasons! Please tell the readers a bit about yourself outside of football. Studied at Heriot-Watt University in Edinburgh. Graduated with an MEng Chemical Engineering. Now an Engineering Officer for the Royal Navy after gaining a commission last year. Besides this sport, I climb and ski when I get the chance. Julian Edelman. In the Superbowl comeback vs the Falcons he never once got his head down or let the score difference get to him. His morale kept the team alive! In the military you learn a lot about morale and how it can impact on an objective. 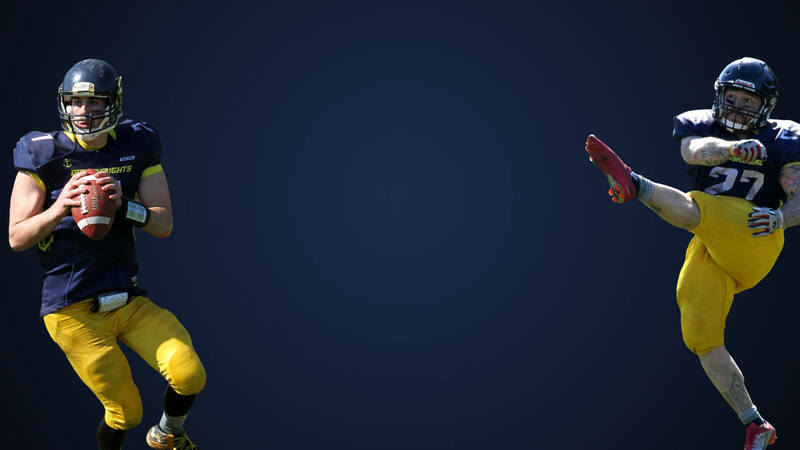 …and then there’s that catch. This and the MVP award will inspire athletes for decades. 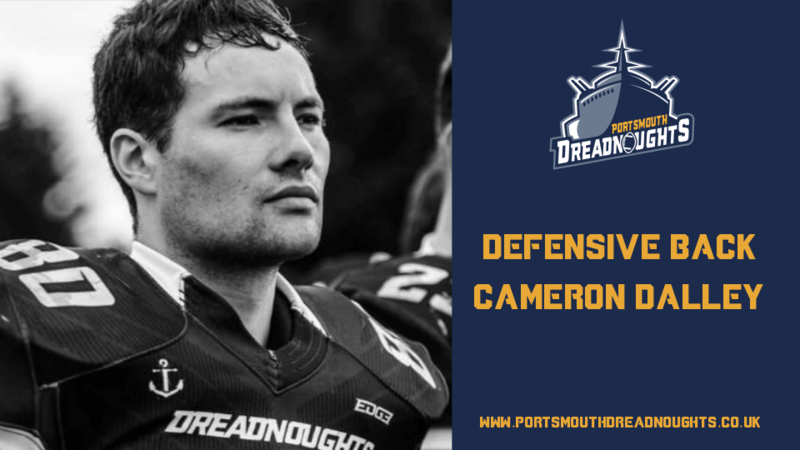 Great stuff from Cameron Dalley, and if you are excited to see Cam take the field, our first game will be Sunday 14th April 13:30 pm at Test Park, Southampton against South Coast rivals Solent Thrashers. If reading this has inspired you to take up American Football please head over to our ‘Join The Team’ tab on the website for either the Men, Women or Academy teams.